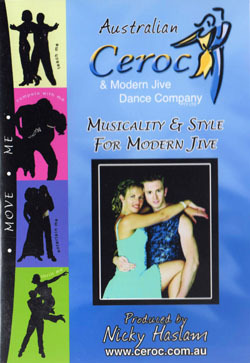 This DVD is the culmination of over 20 years experience of Modern Jive styling and musical development both in the UK and Australia and has all of the essential techniques needed to learn how to phrase your dance and style that phrasing. This original and professional instructional DVD is designed, performed and presented by Nicky Haslam, Founder of Ceroc Modern Jive dancing in Australia and 5 times Australasian Advanced Ceroc Modern Jive Champion and Robert Winter, also Australasian Advanced Ceroc Modern Jive Champion. Nicky & Robert travel extensively across Australia, NZ and the UK teaching and performing their unique brand of Australian Ceroc and are also well renowned Show Choreographers. Together they were the First UK Jive Masters Champions. Nicky first brought the Ceroc style of Modern Jive dance to Australia in 1991.